Kacper Kozak was unlucky to lose his championship bout. City boxing coach Chris Baker was ‘gutted’ after watching a split decision go against one of his fighters at the weekend. 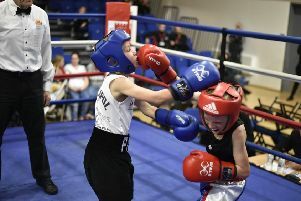 Kacper Kozak, a 15 year-old from Orton, was representing the Peterborough Police Amateur Boxing Club in the NABC (National Association of Boys & Girls Clubs) Championships in Dagenham and looked to have done more than enough to progress to the quarter-finals. He was up against tough customer Charlie Hopkins from the Moneyfields ABC and was gunning for revenge after losing to the same fighter in March. And, according to Baker, he should have got it. “Kacper boxed the pants off him in two rounds. Okay, I admit he lost the second round but he had a fantastic first round and a fantastic third round,” said Baker. “In my eyes we won the bout comfortably and most of the crowd thought so too. But somehow we lost on another split decision. “I was gutted and I was gutted for Kacper. He did everything well and his lateral movement was awesome. I really thought we’d done enough. All the Peterborough Police boxers will be in action at their home show at The Queen Catherine Academy (formerly The Voyager Academy) on Saturday December 16. Tickets are available from the boxers or from Chris Baker on 07921095122. Paston brothers Aiden and Lowen Smith, fighting in Kettering School of Boxing colours, both celebrated excellent points victories on their club’s open show. In front of a huge crowd at the Kettering Athletic WMC, 17 year-old featherweight Aiden set about capable and correct Liam Findlay from Ely with powerful hooks and uppercuts to the body. Short and stocky Smith was scoring well with controlled and precisely-placed punches on the inside and looked to be in for an easy night. But Findlay, to his credit, fought back gamely in the second and should be complimented as a less experienced boxer would have succumbed to the intense pressure applied by Smith. But the Ely stylist was brave and well schooled and came on stronger boxing on the outside. Smith slowed the pace down but he still scored with better selected punches. In the final round Findlay was more determined and faster to the punch but it wasn’t enough to turn the tide as Smith picked up a well deserved victory . His younger brother Lowen (13), described by coach Clive Hogben as ‘ a bundle of tricks’, has come on leaps and bounds from last season with a jack-in-the-box style. His southpaw opponent Ryan Halewood from Hockwell Ring must have wondered what was in front of him as Smith switched stances, jabbed away in range, countered well and used straight shots to the body before moving away.